Rebsie Fairholm is an independent plant breeder, mostly working with peas and potatoes and using heritage varieties for their diverse genepool. 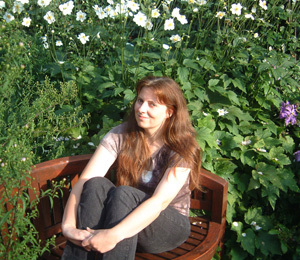 She is based in Cheltenham, south-west England. 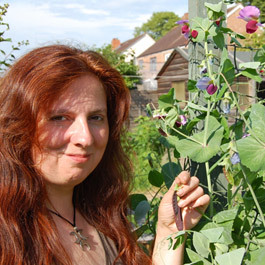 The life and soul of Daughter of the Soil is the original blog where you'll find the most up-to-date stuff about what I'm growing and experimenting with in my garden in the UK. As the blog got bigger it got harder to find stuff, so this sister site is a permanent repository for things I've written about heirloom vegetables, seed saving and garden-based plant-breeding. I was frustrated with the lack of independent information about old varieties ... I don't need to read the same rehashed sales blurb on half a dozen different websites. So I set about collecting and growing heritage varieties and writing reviews of them based on my own observation and honest opinion. My research doesn't attempt to be complete in any sense of the word but I hope you find it useful. You'll also find here a few articles about plant breeding, including instructions for beginners. Let me stress this: plant breeding is something anyone can do. You don't need to know anything about genetics and you don't need a huge garden. Why am I doing all this? Well, I'd like to help revive the lost art of amateur plant breeding. A century ago all gardeners saved seed and selected their own local strains. Now we've got into the habit of going to the garden centre and buying standardised seed (homogenised and mass-produced). As a result of this, centuries of genetic diversity has been wiped, locally-adapted variants are all but non-existent, and the age-old sustainable practice of seed-saving turns to a cycle of commerce. Our long-term food security relies on a diverse genepool, the opposite of what the seed industry is giving us. It's never been more important for us all to grow, save and share our own seeds. Especially in Europe, where the sale of seeds is severely restricted by law, limiting available varieties and bringing another irreversible loss of diversity. The focus of modern plant breeding is on biotechnology, high-input agriculture, variety rights, patents and the needs of large-scale commercial growers; very little work is being done to develop crops for home gardens or for organic cultivation, or for the public domain. What's needed is for more gardeners to join in the effort to reclaim our genepool heritage, to conserve existing varieties and create new ones, and to save and share seeds. I don't sell anything and I'm independent of commercial influence, so whatever I say on this site is my own opinion, rightly or wrongly! In my other life I'm a musician.